I was hoping to get this newsletter online to wish everybody a very happy Christmas, but terrible storms hit us in the south of England, and knocked out power to thousands of homes, including ours. So from Monday to Thursday – all over the Christmas period – Sue & I had to manage the best we could in the darkness, trying to be cheerful and entertaining ourselves, when we’d rather hoped to be enjoying a few BAFTA DVDs or television specials. Thanks to the enormous kindness of friends, we got through the crisis with plenty of Christmas fare and jolly company, but the nights seemed interminable, and we longed for daylight to arrive. Now at last power is restored so I can get out my iron and tackle the pile of shirts that’s been waiting. It’s one of my favourite activities and one of my very few accomplishments. My agent e-mailed me a few days ago and told me I’d had a good year, that I was magnificent and he was proud of me. I confess to a warm glow as I read his generous assessment of the year. And then I delved or dived into my memories of 2013 and wondered what Michael, my agent, had in mind in describing my year as good, and me as magnificent. I suppose he meant my very brief appearance in the 50th anniversary Doctor Who Special, which was definitely a high spot. It’s more than six months ago that I went to Cardiff to record my cameo. I had not read the script, the whole script I mean, which would have given me a clear picture of the story. 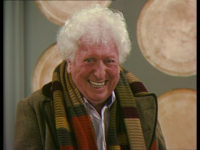 Even when I was The Doctor I never read the whole script before rehearsals started: I just read, very carefully, my own scenes. It was not because I didn’t care, not at all, it was because I felt it was none of my business what happened to other characters in the story when I wasn’t present. 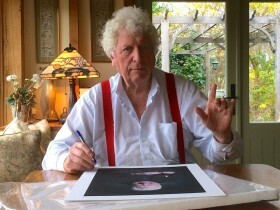 My job was to play the hero, the Doctor, as he reacted to events that affected him. So through the wintry darkness of April, I travelled to Cardiff where my scene was to be shot. 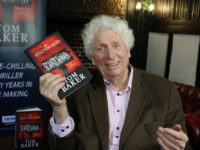 My appearance in the Anniversary Special was to be a secret – a surprise for the fans – so we and the BBC decided that I shouldn’t stay in a hotel in Cardiff in case people guessed what I was there for, so I agreed to travel overnight under cover of darkness. The pick-up was at 1.30am at home in East Sussex. The car was warm and the driver superb, so superb that we arrived in Cardiff at about 4.30am! The BBC had said they would shoot my bit at 8.30am and that I would probably be away in no time at all! That’s what they said. So my driver went off for an early breakfast and I was alone in freezing weather with only a gloomy caravan as shelter. I felt anxious as I walked about the dead BBC film sets and mulled over my mysterious little scene. Alone among dead sets and sad props and in cold weather my anxiety grew. I suddenly found the scene remote. I couldn’t get a handle on it and I began to regret accepting the job. Too late, I was on site and soon to be on set. The time was now about 5.20 so there was plenty of time to become seriously miserable before the call for make-up. And I walked up and down in the semi darkness, nobody to talk to, nowhere to find a cup of hot Bovril: you get the picture. After a while the time passed as I knew it would, but it dragged its feet. Finally people began to arrive and I was called to costume and make-up and finally to the set. In the old days I knew everybody, or nearly everybody, the technicians and make-up people and all the other actors: I was at home in those long gone times. My gloom was lifted by the arrival of Matt Smith who welcomed me so enthusiastically that I began to think life was worthwhile. And so we started to shoot the scene so that I could get away “in no time at all.” Matt and I did not discuss the scene or talk about what it might mean; God forbid! No, we started just after eight o’ clock and about four hours later I was released. I tried to flee but the enthusiasm of the crew meant I was in big demand for pictures and autographs. People were nice but I longed to be away. At last we left and my driver got me back to Sussex by late afternoon. Six months passed before I could judge how the scene would be received. Because I had to keep the secret of my part in the Special, I almost forgot I was in it! And so we came to November 23rd and the 50th Anniversary Celebration at the ExCel Centre, the launch of the Doctor Who Special and the interviews. There were thousands and more thousands of fans there: more than I had ever seen anywhere. At the Q&A sessions (there were two) we had 4,000 fans twice! Their enthusiasm revitalised me and from 9.0am, I was whirled all over the centre from TV interviews to radio huddles, from photo calls, to Q&A sessions. The Excel Centre is so large I had to go by car from one place to the next. It was tumult: the fans cheered as if I had come back from the dead and the cheering did the trick and for a few hours I was my old self. I travelled back in time: it was wonderful. I was too tired to stay for the evening screening of The Day of the Doctor, and the After Party, but I enjoyed it all. And I suspect the other old Doctors did too. It was very sweet to meet Colin Baker and Sylvester McCoy and Peter Davison and they were very kind and cheerful. I am constantly touched and amazed by the personal stories people have told in my guestbook about how watching Doctor Who helped them through difficult times and inspired them to make something of their lives. Thank you for sharing these wonderful stories with me and other fans. I certainly find it very interesting. My heartfelt thanks to those fans who sent me such affectionate messages about my role in the Doctor Who Special. It’s a wonderful feeling to be swamped with love after my cameo appearance. Messages came in from all over the world. Invitations too. The Australians invited me to do a four-week tour on very generous terms. Alas, my travelling days are over. 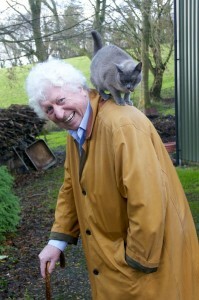 But in the New Year I expect to do more Who audio adventures for Big Finish Productions. Most of you know about Big Finish, but if you don’t, google them up and be amazed. I have never been happier at work than I am with my colleagues at Big Finish. And as you can see from their site, the actors are well cast and are wonderful company. One of our principal directors, Nicholas Briggs is also a very accomplished theatre actor, specialising in Sherlock Holmes. He is a formidable Dalek impersonator and a great presenter at Who conventions. All this year, in between all this Whooha, I have been nourished by my daily walks in the wood with our dog Poppy and our quirky little Burmese cat called Jazz who loves walks as much as Poppy even when the weather is bad. However, if it rains she leaps from ground level onto my shoulders for a ride so she doesn’t have to get her feet wet and curls around my neck to avoid the mud and puddles. To pass the time on bleak mornings I recite a few favourite passages from Shakespeare! Sometimes Jazz peers into my mouth as I spout speeches from Richard the third.